TrustInSoft Analyzer is a static source code analysis platform inspired by the way you develop sensitive code. From open source to business, you can formally understand, debug and verify code with the confidence that TrustInSoft Analyzer will never miss anything. 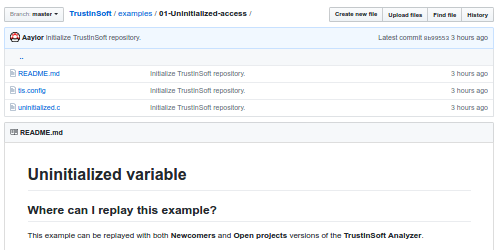 In this short introduction video to TrustInSoft Analyzer newcomers, you will see how to formally verify the absence of undefined behavior in your tests. 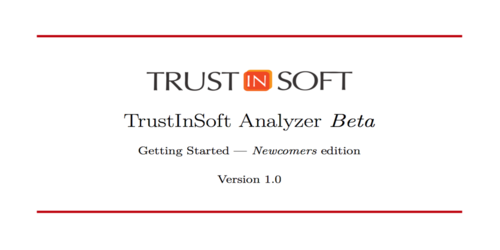 This tutorial is a full tour guide to TrustInSoft Analyzer Newcomers edition. It shows how to analyze existing tests, and how to verify your own projects. Fork our library of examples to discover the newcomers edition. Select the appropriate tis.config file in TrustInSoft Analyzer to start the analysis. Each example contains a README file that explains the undefined behavior found, and the workflow to understand and go back to the origin of the issue. 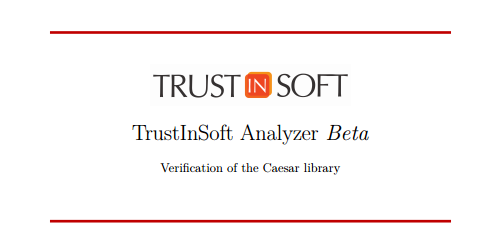 This tutorial is a full tour guide to TrustInSoft Analyzer and its verification methodology. It shows how to incrementally increase the coverage of your formal verification: from tests up to exhaustive verification. Here is a demo of TrustInSoft Analyzer, applied on one of the most used libraries in the world, ntpd, that defines and maintains time on computers.